The insect sector is emerging quickly. Ensuring reliable, high-quality output is essential in order to be successful. 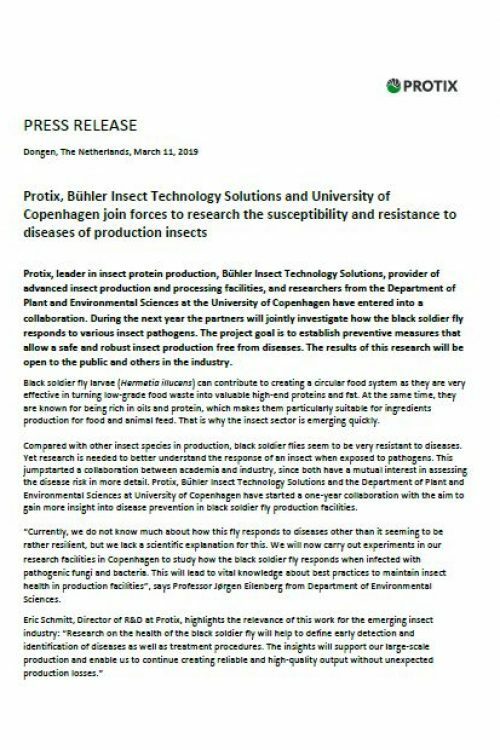 To increase our knowledge about maintaining insect health in production facilities, we join forces with Bühler Insect Technology Solutions and the University of Copenhagen and research the novel territory of diseases in insects. During the next year the partners will jointly investigate how the black soldier fly responds to various insect pathogens. The project goal is to establish preventive measures that allow a safe and robust insect production free from diseases. The results of this research will be open to the public and others in the industry. We invite all colleagues in the industry to ask questions, review the project results and to share their own experiences by reaching out to the University of Copenhagen in order to enrich the industry’s knowledge on this topic.